The site was created and registered on the 10th of May 1999 for the personal enjoyment of Southern Miss fans everywhere. minutes or until sausage is browned. (2) Stir in chicken and the rest of the ingredients. (4) Garnish with fresh cilantro sprigs if desired. Put beans, onion soup and worchestershire sauce in a slow cooker. After beans are heated, add barbeque sauce and cook 30 to 40 minutes. Make a day ahead so the beans will have time to absorb the flavor. Preheat oven to 350 degrees. Mix dry ingredients. Add eggs and melted margarine. Stir until well blended. Pour into pie shells and bake at 350 degrees for 30 minutes. Great served hot or cold and travels well. Food, Fun, Fellowship, Festivities, and of course ...Football ! No Southern Miss Saturday would be complete without a day of tailgating. 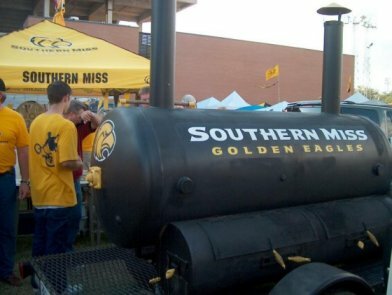 The tradition of tailgating at Southern Miss seems to grow each year. The pre-game sights and sounds begin early...as the tailgaters arrive to claim their turf. Soon the aroma of outdoor cooking permiates the campus. Laughter and gameday festivities soon follow as the excitement escalates towards kick-off. Marinate chicken in the buttermilk in a n airtight container overnight. Mix flour and seasonings in Ziploc bag, add chicken and shake until all pieces are coated. Fry until golden brown. Cook each meat seperately, mixing in spices as needed (to taste). Hollow out the bread. Mix meat, sausage, cheese. Use a small portion of the grease from the sausage to make a gravy; mix grease and Tony Chacherie's Roux Mix to make. Put meat mixture, gravy and more cheese on top in hollowed out bread and bake until the bread is browned and crispy. 1 tsp Chopped Chives and seasonings. In a food processor fitted with steel blade, combine cheddr cheese, butter, mustard, horseradish and pepper. Process until cheese is finely chopped. Heat beer to boiling; with machine running, slowly pour hot beer into cheese mixture. Continue processing about 30 seconds or until fairly smooth. Transfer to serving bowl; chill. Let stand at room temperature 1 hour before serving. Sprinkle with chives. Serve with crackers, pretzels, or vegetables. Mix all ingredients together and bake in a jelly roll pan (greased). Bake at 350 degrees for 25 minutes. Cream & mix the first four ingredients together. Then add sifted powdered sugar. Mix and frost baked, uncut bars. Cut and serve bars. 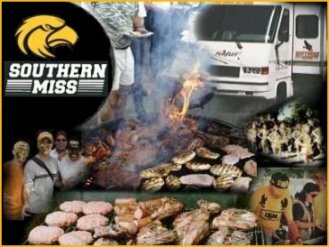 The Southern Miss Alumni Association is compiling recipes for a cookbook that will be published in the near future, and they want your favorite recipes. 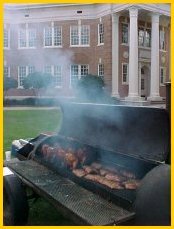 Mail your recipes to the Southern Miss Alumni Association, Box 5013, Hattiesburg, MS 39406, fax them to (601)266-4214, or e-mail them to cookbook@usm.edu. 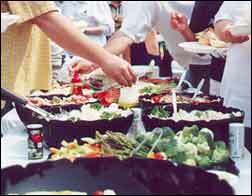 You may also forward any recipes to Judie Kochenower who is heading up the project.